Whipperley Infant Academy is a school which prides itself on being at the heart of the local community. Our community has families from a wide range of faiths and backgrounds and reflects the mutli-cultural, ever changing nature of the United Kingdom. As a school we celebrate and value the diverse make up of our pupils and other stakeholders. We endeavour to prepare our children to live in the wider community and to keep them safe. We often welcome families who are refugees or may be seeking asylum in the United Kingdom as they flee conflict or persecution in their home nation. At the core of our vision and values is respect and tolerance for all. We have strong equal opportunity policies which ensure that discrimination against any individual or group, regardless of faith, ethnicity, gender, sexuality, political or financial status is not allowed in any form. We promote and reinforce British Values through our curriculum, school policies and our school vision and values. We recognise that we play a vital role in ensuring that our young people are not subjected to intimidation or radicalisation by anyone wishing to unduly or illegally influence them. The following examples will show some of the ways we seek to promote British Values for our pupils in their everyday school life. 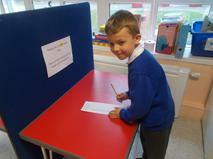 Pupils have the opportunity to have their voices heard through the school council. 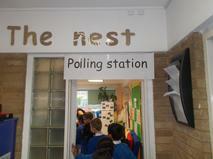 Each class has two representatives on the council who are voted for by their peers through an election process. These council members represent the voice of their classmates and are also encouraged to take ideas back to the classroom for wider discussion and debate. The school council report back to the Headteacher and pupil voice is used to support a wide range of school decisions for example improvements to assemblies and the KS1 playground. When new topics are introduced in classes pupils are encouraged to put forward their ideas about what their learning will entail and what they would like to find out through their learning journey. In the EYFS all topics are undertaken based on pupil interests and planning is fuelled by the excitement of the children. Learning is evaluated everyday and changed each afternoon as the need arises. Pupils are actively encouraged to listen and take into account the views of others. This is reinforced through circle time and in our restorative approach to behaviour management. Pupil’s questionnaires are often used to gauge the views of our young people. They support all aspects of our work with them. For example, following any intervention which involves pupils missing out on one learning opportunity to undertake another their view is sought. Classes always start the year by making a class charter which focuses on everyday rules for the smooth behaviour management of the class. 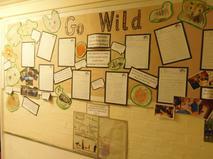 Pupils put forward their ideas and they are agreed collectively and signed by both staff and pupils. The importance of laws, whether they be those that govern the class, school or the country, are consistently reinforced throughout the school day as well as when dealing with behaviour. Pupils are taught the value and reasons behind laws, that they govern and protect us, the responsibilities that this involves and the consequences when laws are broken. We have developed close relationships with the community police officers and the fire service and they visit the school regularly to reinforce this message... For example the fire service will talk to the children about the dangers of making false 999 calls. With our restorative approach to behaviour management pupils are encouraged to think about the consequences for unacceptable behaviour and the impact of their behaviour on others. Pupils are encouraged to make positive behaviour choices through our ‘Stay on Green’ system and each pupil knows that they have a new chance everyday to make better choices with their own behaviour. Our pupils are actively encouraged to make their own choices and to direct their own learning opportunities. This starts the moment they enter the EYFS where they can engage in a wide range of child led activities. The can do this knowing they are in a safe environment where they can feel empowered to steer their own learning journeys. Pupils are encouraged to know, understand and exercise their rights and personal freedoms always ensuring that they are safe in doing so. For example our strong e safety message supports our pupils to stay safe on line and starts a lifelong skill preparing them for the world of the future. We actively encourage our pupils to share their views and opinions on a wide range of topics through our creative curriculum. Giving our pupils an exciting outdoor environment to explore at playtimes and lunchtimes and giving them choices of activities to participate in. Giving pupils additional responsibilities i.e. playground monitors/buddies, feeding the school fish, carrying messages and supporting younger children. The key themes of our school ethos, vision and values and our behaviour policy are centred on respect and tolerance for all. All members of the school community treat each other with respect and care. Our school environment and displays demonstrate our care for each other and our love of learning. They encapsulate how valued each and every pupil in our school is and how their work is to be celebrated. All staff maintain high expectations of each other and pupils. Very effective, positive relationships are developed with pupils to nurture successful behaviours for learning. This is achieved through enhancing pupils understanding of their place in a culturally diverse society and by giving them opportunities to experience such diversity. Assemblies are often a vehicle to support work on helping pupils to understand prejudice and prejudice based bullying. We encourage visits from members of different faiths or religions and we welcome visitors who speak languages other than English to share their skills and knowledge in classes. For example visitors telling stories in different languages or sharing their experience of time spent in countries other than the UK. We will continually support and promote British values because they support and help our pupils to become positive and safe citizens of our local community and the world.